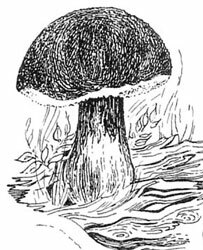 "It's a promising start to what could be a particularly good mushrooming season." 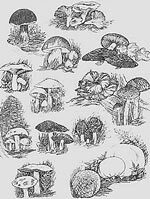 That's my feeling about Fall, 2012 mushrooming on the southern Oregon coast. 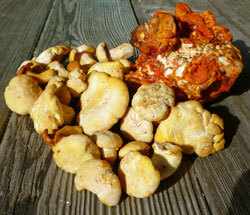 We'd been hearing rumors and reading e-mails about how the chanterelles and lobsters were fruiting everywhere. It wasn't until yesterday that we actually walked the property searching for fungi, and we were not disappointed. White and golden chanterelles along with lobsters were easily spotted. We found a nice collection of perfect specimens! Even I have my limits. Every time I opened the top freezer door, two quarts of dark blue/purple Oregon grape berries (Mohonia nervosa) peered out at me, reminding me that I hadn't kept my promise. On a lark, we'd picked them last fall on Mt. Hood, where the 2' high plants were growing in abundance across from a favorite white chanterelle spot. They were so easy to pick; they virtually fall off the stem and into our buckets. I had placed the washed berries in plastic quart containers and frozen them upon our return to Port Orford, mentally committing to make them into jelly at my earliest opportunity. Days stretched into weeks as other priorities screamed louder. And every time I opened that freezer door, I was reminded of my procrastination. Saturday, I just couldn't stand it any longer. Out came the berries. As a volunteer Master Food Preserver with Oregon State University, I naturally looked to OSU's leaflet, Preserving Foods: Wild Berries & Fruits, SP 50-536 for a recipe. Imagine my consternation when the instructions said to leave the berries on their stems! We hadn't done that. I made a few phone calls and sent a couple of e-mails but no one seemed to know why it was important to process the berries with their stems intact. I proceeded to prepare the Oregon Grape Jelly recipe found in SP 50-536 without including their stems and the final product was fabulous! The jelly is extraordinary - it's unique taste could be likened to an incredibly rich and intense blackberry flavor with citrus, spicy undertones. We've tried the jelly on waffles and on toast, and the flavor of the jelly just exploded on our tongues. 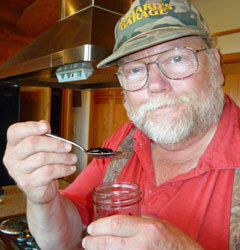 Steven gives the Oregon Grape Jelly his seal of approval! Every once in a while you find a wonderful recipe in an unexpected place. So it was with us not too long ago. We'd briefly stopped at Safeway on our way up to Brightwood to pick up a couple of things for a quick breakfast, including a package of Hormel Little Sizzlers, a couple of oranges, and a bag of sourdough muffins. We wanted to have a light breakfast at the cabin before starting off for a mushroom hunt in a favorite prime bolete area later in the next day. It's great to have dried boletes on the pantry shelf.